We hope everyone is surrounded by their family and friends today as you prepare a delicious meal and give thanks to many things. 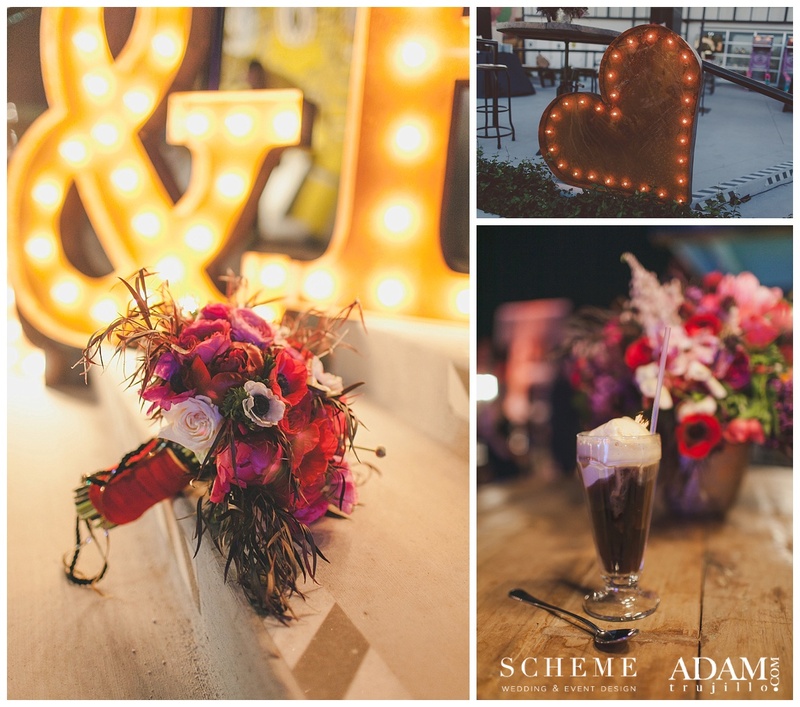 The Scheme team is forever grateful for all the love and support our families, friends, couples and vendors have shared with the launch of our new site and our business over the last 4 years. Thank you so much! We send our love right back and wish you a very Happy Thanksgiving! 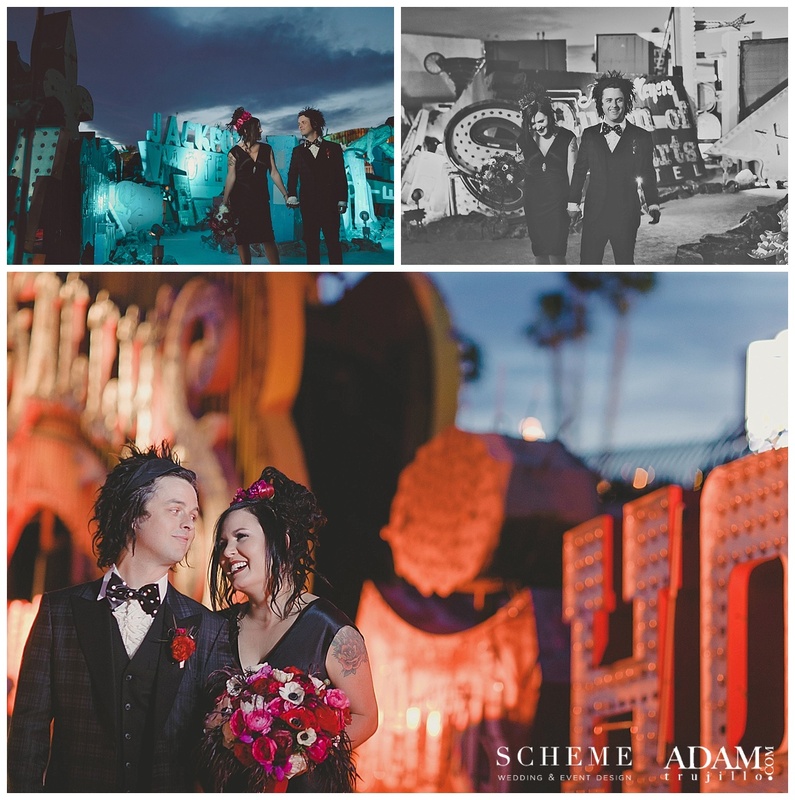 Once I looked back and digested all of the beauty in this amazing Las Vegas Neon Museum vow renewal, I wished I could host an event this beautiful every single weekend. I am honored to share this very special day with you. Adrienne and Billie Joe were, hands down, two of the most down-to-earth and loving people I’ve ever met. Working with such a great team of vendors like Adam Trujillo, Layers of Lovely and LED Unplugged always creates a great event. When Billie Joe met Adrienne in 1990, he knew she was the one. 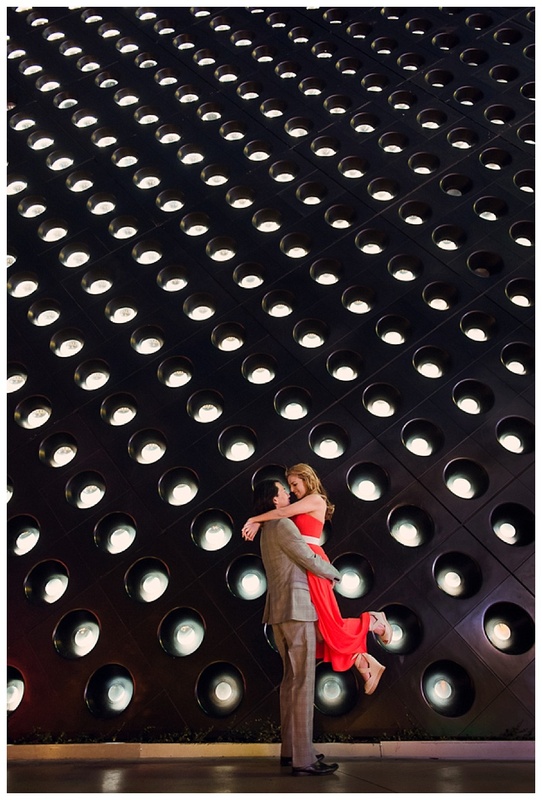 They wed a short four years later in 1994. 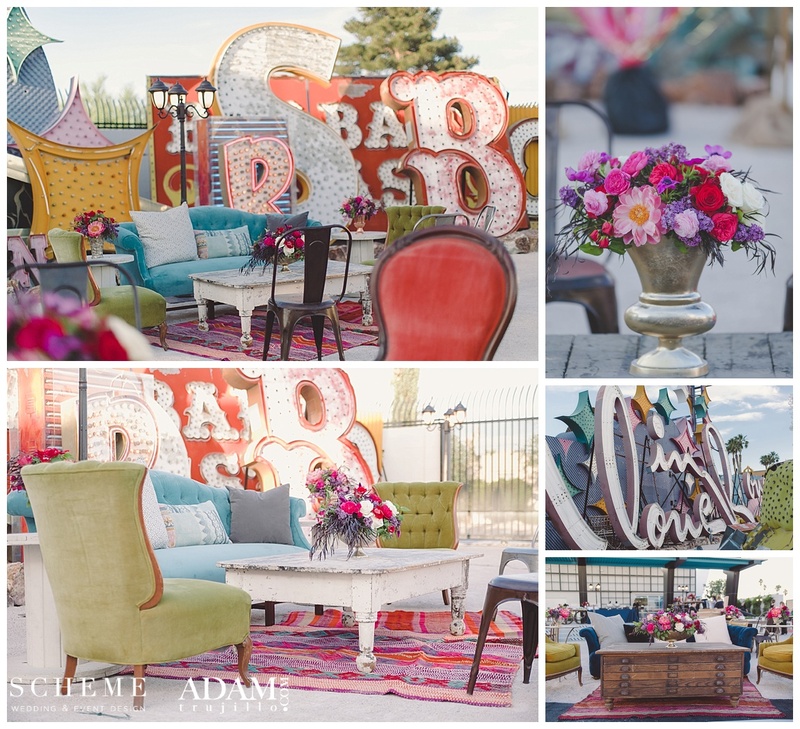 Fast-forward 20 years to their Las Vegas vow renewal and you get what you see below — a stunning, laid back yet chic event. 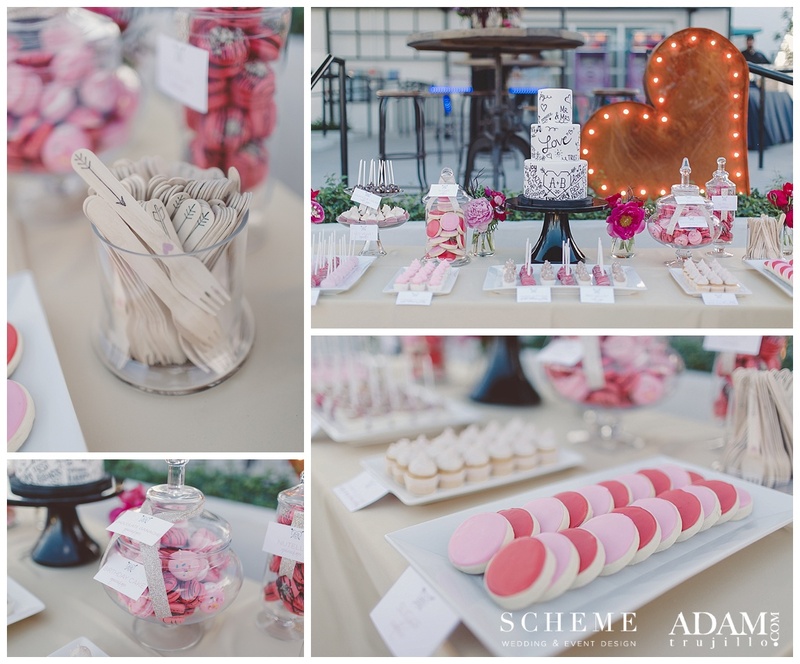 When Adrienne first reached out to me, I was instantly blown away with her diversified taste for this event. Hearing the words “vintage grunge” made my heart jump for joy. Everyone who knows me is aware I love music and going to shows. I spend a good amount of my free time in dive bars for shows, so this was the type of event I’ve always wanted to plan. 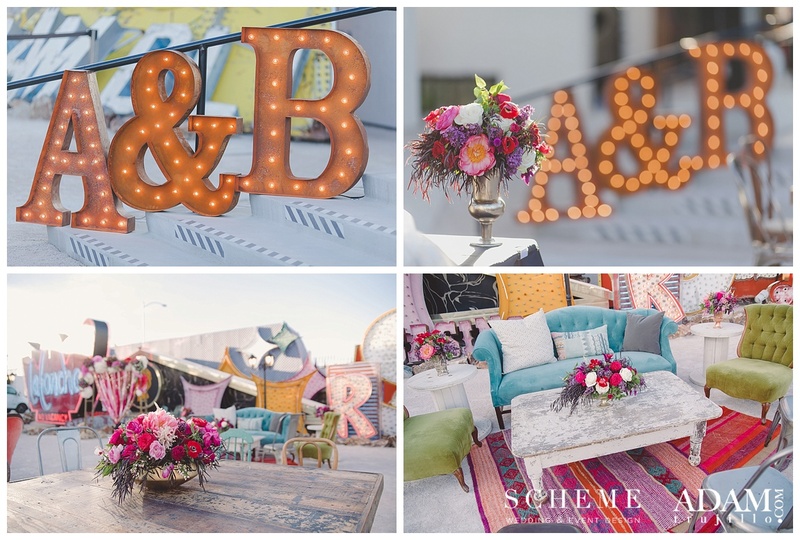 Adrienne envisioned mixed textures, mixed furniture, games and an all-around relaxing vibe for their guests. 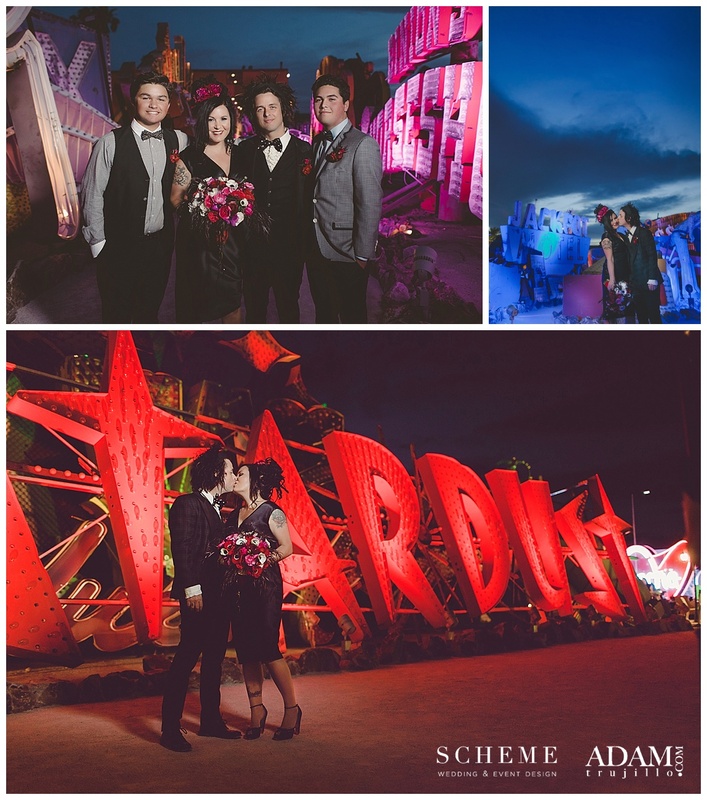 I had always hoped to work at the Neon Museum, and it proved a flawless setting for their theme. Shuttles delivered the guests, which were welcomed by cocktails and passed hors d’oeuvres until the vow renewal began. 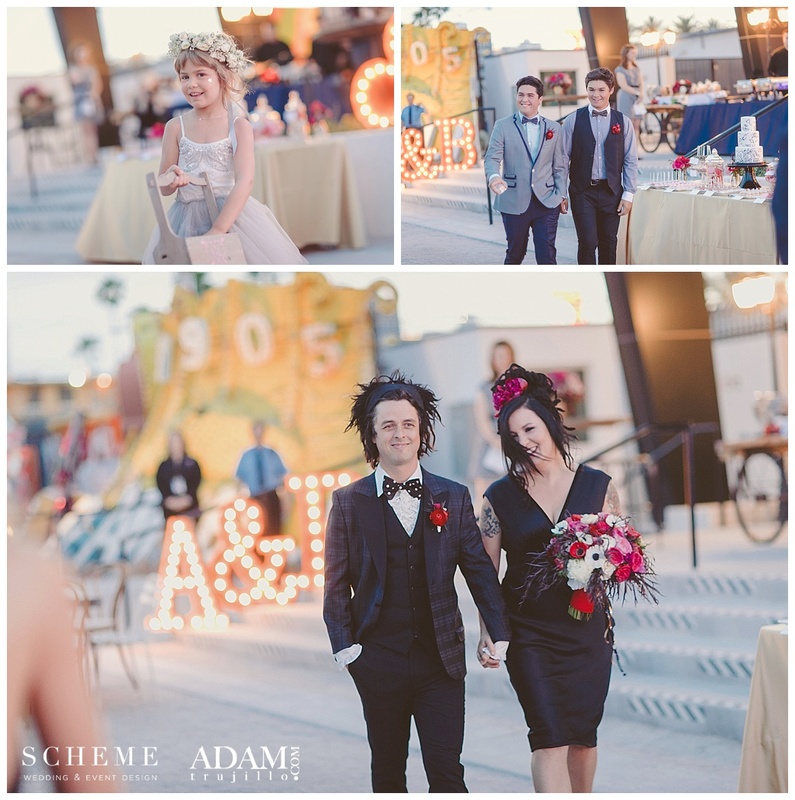 The ceremony began once Adrienne, Billie Joe, their two children and the rest of the family arrived. 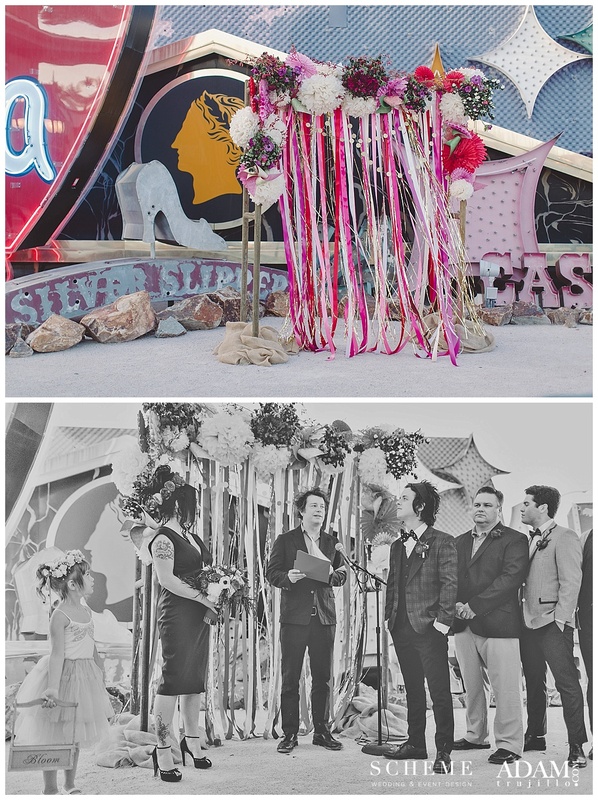 Close friend and bandmate Jason White officiated. Guests enjoyed music, dancing and food catered from Divine Events. But the fun didn’t stop there. 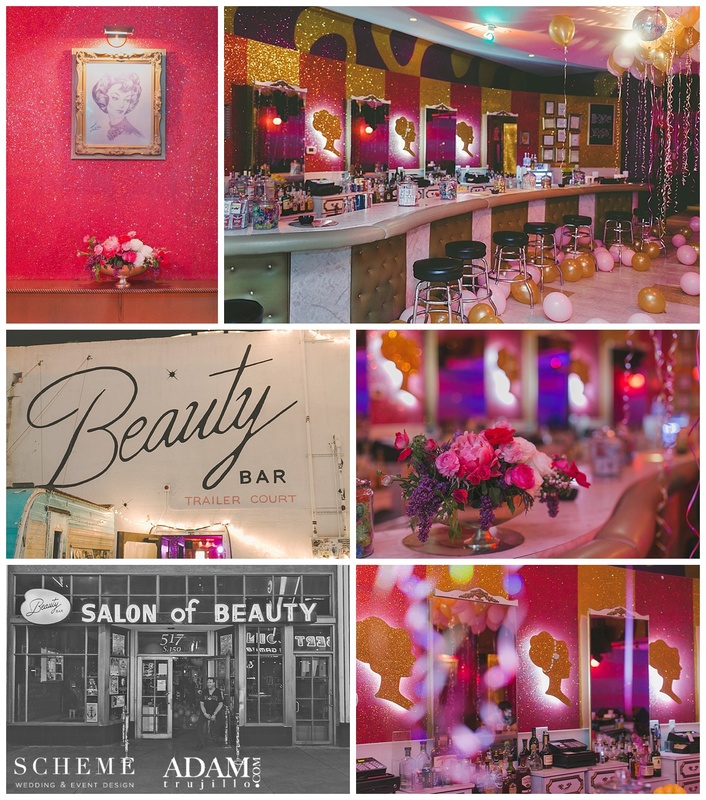 Beauty Bar in Downtown Las Vegas hosted the rest of the evening. 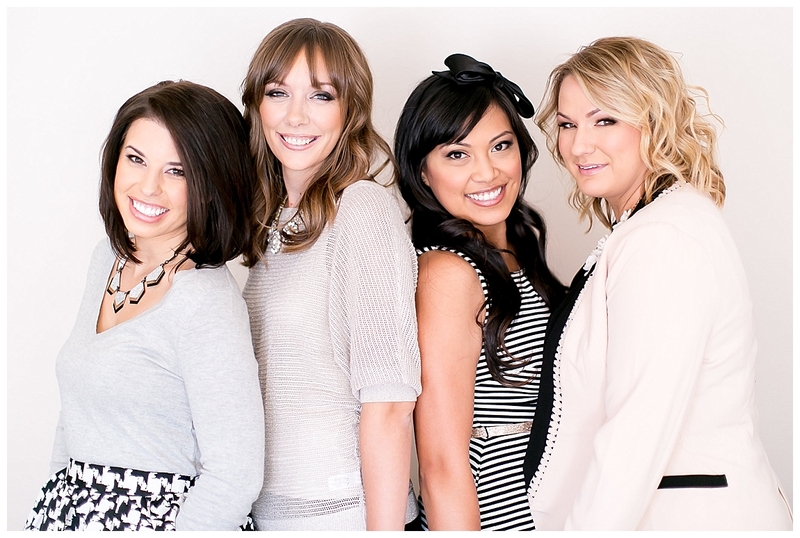 I’ll always vividly remember Adrienne first walking into Beauty Bar and declaring, “This is so us. This is perfect.” And it was perfect. A henna artist, hundreds of balloons streamed from floor to ceiling, a taco cart and a shaved ice stand welcomed guests to paradise. 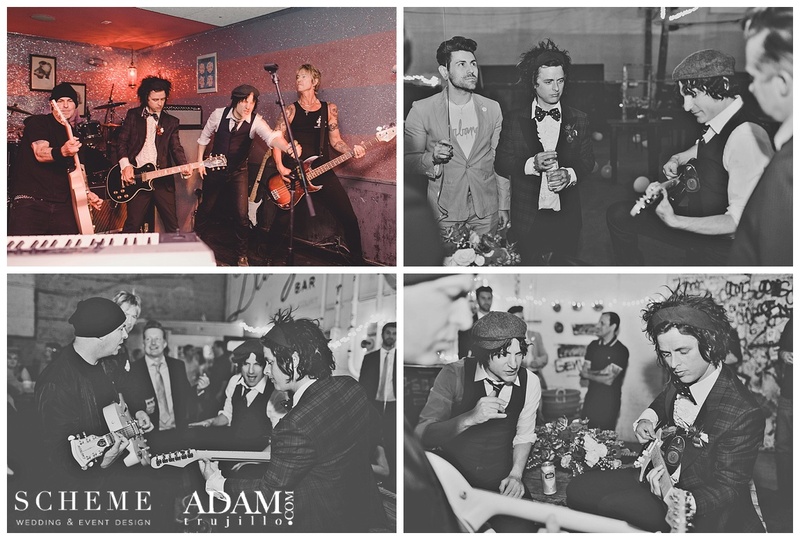 And who could ever forget the live music played by Billie Joe himself along with Green Day bandmate Tre Cool, Guns N’ Roses’ Duff McKagan, Rancid’s Tim Armstrong and several other close friends of the couple? 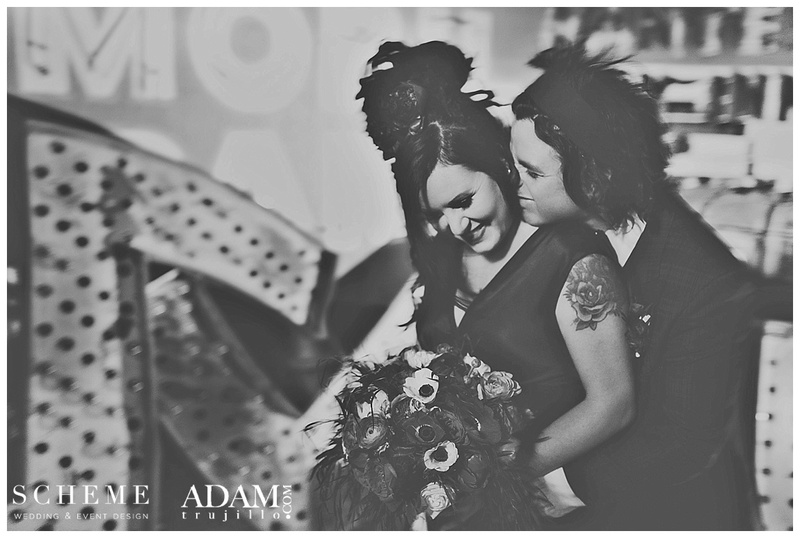 All images are copyright and protected by Adam Trujillo Photography. 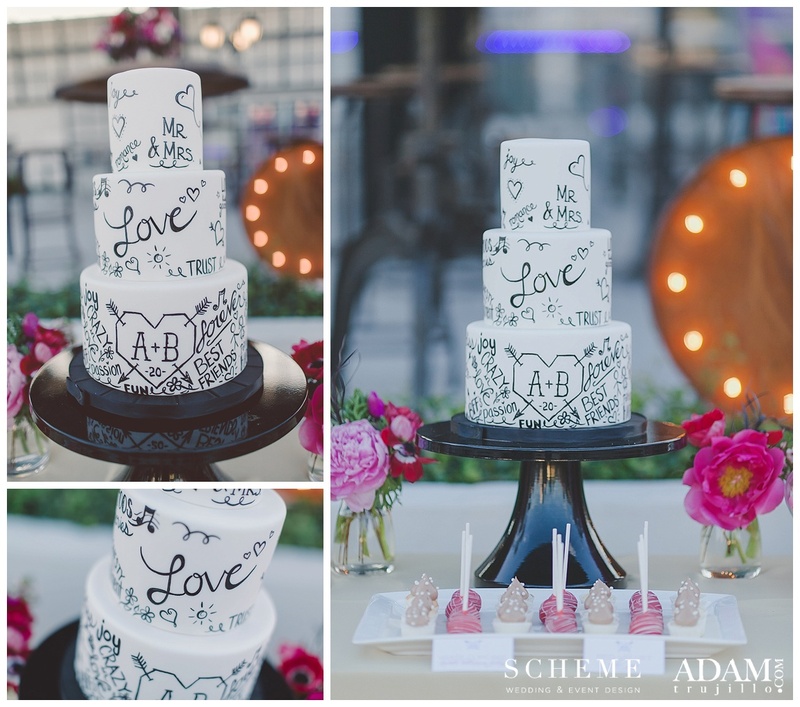 No images are to be used without written permission from Adam Trujillo Photography. Any unlawful use of images will be first asked to cease and desist as these are not to be used for any promotional use outside Adam Trujillo Photography and Scheme Events. Please email with any questions or requests. I am excited to introduce you to Joni & Erick! They both moved to Vegas for medical specialties and first met while Joni was interning at the ICU and Erick was her boss. Erick taught Joni how to put in an arterial line into a patients arm on the first day of the job (sounds like seriously business to me!). Over the next month, the two bonded over mutual interests and Erick invited Joni over to meet his corgi, Stu. Since then, Erick and Joni have moved in together and taken their relationship to the next level–getting another corgi! 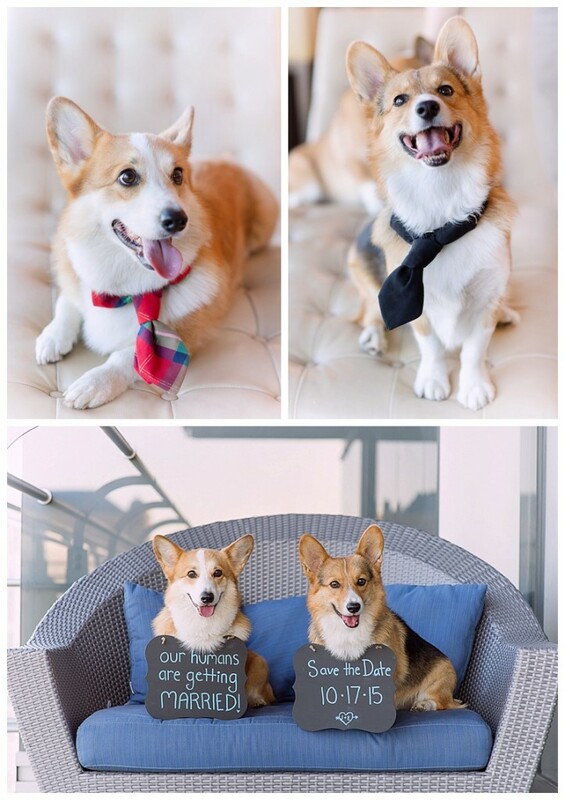 Yoshi the corgi joined the family and before you know it, this foursome was meeting up with Chelsea Nicole for some out of this world engagement pictures! Next Fall, we’ll be bringing an all-star team together for wedding ceremony and reception pool side at Four Seasons Las Vegas. Stay tuned!